Glucosinolate breakdown products are volatile, therefore good candidates for insect fumigants. However, although they are insecticidal, the mode of action of such natural products is not clear. We studied the insecticidal effect of these compounds as fumigants, and monitored the production of carbon dioxide by the insects as a probe to the understanding of their mode of action. The fumigation 24-h LC50 against the house fly (Musca domestica L.) of allyl thiocyanate, allyl isothiocyanate, allyl cyanide, and l-cyano-2-hydroxy-3-butene was 0.1, 0.13, 3.66, and 6.2 μg cm-3, respectively; they were 0.55, 1.57, 2.8, and > 19.60 μg cm-3, respectively, against the lesser grain borer (Rhyzopertha dominica Fabricius). The fumigation toxicity of some of the glucosinolate products was very close to or better than that of the commercial insect fumigants such as chloropicrin (LC50: 0.08 and 1.3 μg cm-3 against M. domestica and R. dominica, respectively) and dichlorovos (LC50: < 0.02 and 0.29 μg cm-3 against M. domestica and R. dominica, respectively) in our laboratory tests. Significantly increased CO2 expiration was found in insects exposed to the vapor of allyl isothiocyanate, allyl thiocyanate and allyl isocyanate. Allyl isothiocyanate was also found to increase the CO2 expiration of the American cockroach (Periplaneta americana L.). Glucosinolate breakdown products have potential as biodegradable and safe insect fumigants. They may act on the insect respiratory system in their mode of action. Plants in the family Cruciferae, such as cabbage (Brassica olerecea), mustard (Sinapis alba) and crambe (Crambe abyssinica) produce glucosinolates which are secondary metabolites that can help plants defend themselves against phytophagous insects, fungi and other pests. Glucosinolates are hydrolyzed by thioglucosidase (myrosinase) enzymes to yield an aglycone which undergoes non-enzymatic rearrangements to produce organic isothiocyanates, thiocyanates, nitriles and other products [1, 2], although non-enzymatic thermal degradation of glucosinolates may produce chemical species identical to products of the enzymatic hydrolysis [3, 4]. The chemical structures of the hydrolysis products (breakdown products) of glucosinolates vary depending on the precursors in different plant species, and different endogenous or exogenous factors such as pH and ferrous ions [2, 5, 6]. Glucosinolates and their breakdown products have been the focus of many studies because of the possibility of using them as natural pesticides [7, 8]. However, it is considered that glucosinolates themselves possess limited biological activity until they are hydrolyzed . The breakdown products are generally relatively small molecules which make many of them volatile. Many of these volatiles have been shown to act as attractants for certain insects seeking food or egg-laying sites rather than direct insecticidal activity [10–14]. Allyl glucosinolate (sinigrin) breaks down in soils to allyl isothiocyanate and allyl cyanide, and these breakdown products and glucosinolate-containing plant tissue have been suggested for use in controlling soil-borne plant pests [9, 15–19]. Despite the many efforts that have been devoted to exploring glucosinolates and their breakdown products as naturally occurring pesticides, few products have been marketed commercially. 2-(2-Butoxyethoxy)ethyl thiocyanate (Lethane 384®) and isobornyl thiocyanoacetate (Thanite®) were marketed as insecticides, and methylisothiocyanate (Vorlex®) as a fumigant, although their discovery may or may not have been directly related to glucosinolates. The thiocyanates (Lethane 384 and Thanite) were discontinued by their manufacturers in 1984  and methylisothiocyanate, the closest relative of the glucosinolate breakdown products, was also banned in 1991 . Harvested crops including seeds, grains and cereals suffer a loss of at least 10% from insect pests during storage. Losses of 30% are common throughout large areas of the world . Many chemical fumigants such as ethylene dibromide and methyl bromide that have been used to control these stored grain insects are being banned or facing phase-out. There are clearly needs for alternative fumigants. We have reported the insecticidal activity of the glucosinolates in crambe in our previous study, and found that allyl, 3-butenyl, 4-pentenyl, 4-hydroxybenzyl and 2-hydroxy-3-butenyl glucosinolate were the major glucosinolate components in crambe seed meal . We also found that 2-hydroxy-3-butenyl glucosinolate was the predominant glucosinolate among the crambe glucosinolates, and its major breakdown product (>95% of total glucosinolate) was 1-cyano-2-hydroxy-butene (CHB) . CHB and other crambe glucosinolate breakdown products were found to have fumigation toxicity against insects in our early study . Different fumigants have different insecticidal mode of actions, and some fumigants are known to affect the respiratory function of insects . Although it has been reported that the CO2 expiration of Tenebrio molitor was reduced by feeding glucosinolate-containing rapeseed meal , there are no previous studies on the effect of the glucosinolate breakdown products on insect respiration. In this paper we report the insecticidal activity of crambe-related glucosinolate breakdown products as fumigants and the effect of these chemicals on the respiratory function of insects. The latter is achieved by measuring the CO2 emission of the insects that are exposed to the chemicals. The fumigation effects of the breakdown products were compared and discussed together with the known fumigants dichlorovos and chloropicrin. The effect of the glucosinolate breakdown products on CO2 emission was also compared with that of hydrogen cyanide and rotenone. The house fly (Musca domestica) and the lesser grain borer (Rhyzopertha dominica) were chosen in the laboratory toxicity test, based on the availability and their significance as pests. In fact, glucosinolate-containing extracts from crambe were found to be toxic to the larvae of the house fly . In the present study, we have found that some of the individual glucosinolate breakdown products from crambe were insecticidal toward M. domestica as potent fumigants. The respective LC50 of allyl thiocyanate (ATC), allyl isothiocyanate (AITC) and allyl isocyanate(AIC) were 0.1, 0.13 and 0.63 μg cm-3 (Table 1). This is in the same potential range of the toxicity of chloropicrin (0.08 μg cm-3), a commercial fumigant. CHB, the major breakdown product of crambe glucosinolates was not as potent a fumigant as others. Its LC50 was 6.2 μg cm-3 (Table 1). Fumigation toxicity of glucosinolate breakdown products against the house fly adults in comparison with selected fumigants (exposed for 24 h). Different insects have different susceptibilities toward chemicals. Although dichlorvos was almost 10 times as toxic as chloropicrin in house fly test (Table 1), it was only 5 times more toxic in the lesser grain borer test (Table 2). ATC, the most potent fumigant against the house fly was the most toxic against the lesser grain borer as well. Its LC50, 0.55 μg cm-3, against the latter insect was between that of dichlorvos (0.29 μg cm-3) and chloropicrin (1.3 μg cm-3). LC50's of allyl isothiocyanate (1.57 μg cm-3) was in the same range of toxicity as chloropicrin. Allyl isocyanate (2.2 μg cm-3) and allyl cyanide (2.8 μg cm-3) were slightly less toxic compared to chloropicrin, although they were all about 1/10 as toxic as dichlorvos (Table 2) Allyl isocyanate was tested to compare with the glucosinolate breakdown products. Fumigation toxicity of glucosinolate breakdowns products against the lesser grain borer in comparison with selected fumigants (exposed for 24 h). * CO2 in μg/mg body weight by B. germanica. Exposed for 1 h. ** Done in a separate experiment. The high fumigant toxicity of the glucosinolate breakdown products against the lesser grain borer may have important economic impact on stored grain insects management. These naturally occurring chemicals were also insecticidal as fumigant on other stored grain insects such as the sawtoothed grain beetle (Oryzeaphilus surinamensis L.) and the red flour beetle (Tribolium castaneum Herbst) (Tsao, et al., unpublished data, 1997). Long-term fumigation tests against the lesser grain borer showed little improvement in the toxicity of the glucosinolate breakdown products. Also, the 2-day and 4-day tests resulted in higher mortality in the control (data not shown). Little is known about the mode of action underlying the high fumigation toxicity of the glucosinolate breakdown products. Dichlorvos exerts its insecticidal toxicity against the insect nervous system, by inhibiting acetylcholinesterase. Methyl bromide and chloropicrin's insecticidal mode of action has been shown as their reactions with the nucleophilic sites such as OH, SH or NH2 groups in vital enzymatic systems . Many non-fumigant insecticides are known to affect the respiratory function of insects (e. g., rotenone, dinitrophenols) . In our fumigation test technique, inhalation (intake through the spiracles) was the only way for the insects to receive the volatile chemicals, although certain degree of absorption could occur through the cuticle. Monitoring the CO2 production of the insects at sub-lethal doses in a closed chamber may provide valuable symptomatic information toward understanding how these chemical volatiles affect the respiration of insects and lead to the eventual death of the insects. Monitoring CO2 emission is one of the well established technique to study insect respiration and the effect of chemicals on the respiratory function, although it has sometimes been accompanied with simultaneous monitoring of oxygen consumption [24, 26]. The quantity of the chemicals used in our CO2 test was based on the toxicity tests of the chemicals (data not shown). At the sub-lethal levels, no mortality was observed within the test period. For AIC, ATC and AITC, the amount of chemical utilized was 200 μl of 104 ppm corn oil solution. This is equivalent to ca. 10 μg cm-3 of the chemical in air. This concentration is lethal to the lesser grain borer and the house fly, but not to the cockroaches due to different physiological aspects and the shorter exposure time in the CO2 monitoring test. 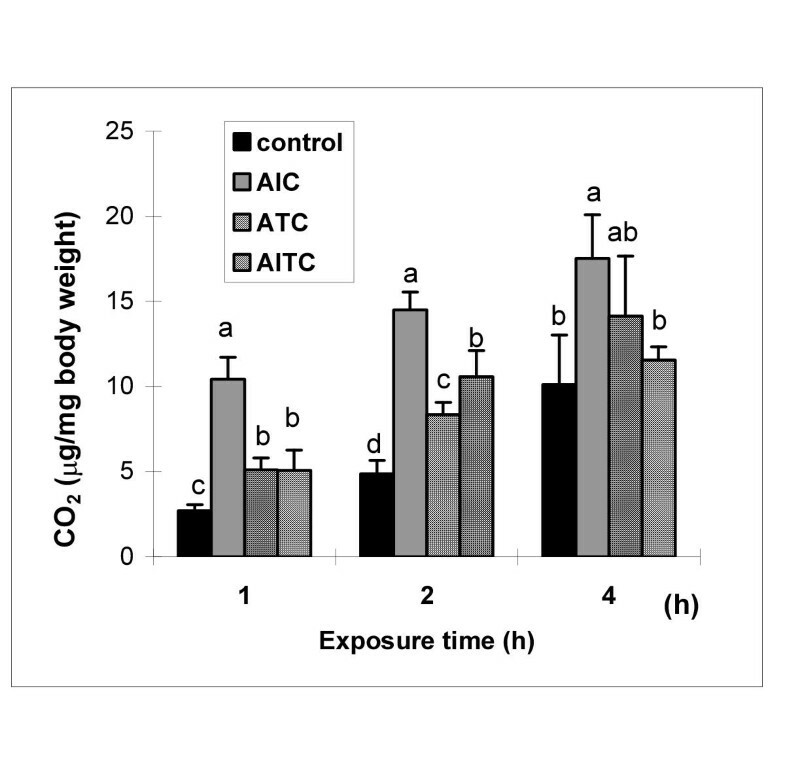 By exposing B. germanica to the fumes of the glucosinolate breakdown products AIC, ATC and AITC, we found that the CO2 production of this insect was significantly increased at each time interval (Tables 1 and 2, Fig. 2). AIC was the strongest CO2 emission (respiration) enhancer. B. germanica treated with AIC produced more than 3 times more CO2 than that in the control after being exposed for 1 h and 2 h. Even after 4 h, the CO2 emission was more than 75% higher for AIC (Fig. 2). Although ATC and AITC did not increase the CO2 emission as strongly as did AIC, these two chemicals still showed significant effects after 2 h. The effect was not as significant at 4 h for ATC and AITC (Fig. 2). The effect of AIC, ATC and AITC on the CO2 emission of the B. germanica adults at different time intervals. Bars within the same group followed by the same letter are not significantly different (LSD, α = 0.05). 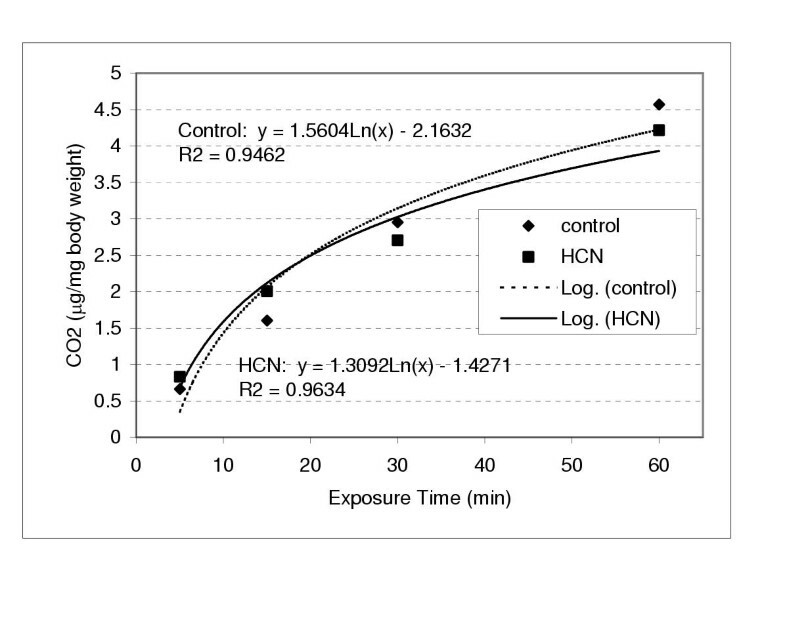 HCN and rotenone were tested for comparing the mode of action of glucosinolate breakdown products, because they are potential inhibitors of CO2 production . AITC may have a different mode of action on the respiratory system than HCN and rotenone as the CO2 production of P. americana was significantly increased by AITC as compared to the control (Fig. 3). The CO2 emission of P. americana was not significantly affected by HCN or rotenone during the test period (Fig. 4 and 5), indicating that these chemicals may not affect the respiratory system of the insect under the dose used in this experiment. The less effectiveness could be due in part to the low concentration of HCN and rotenone. 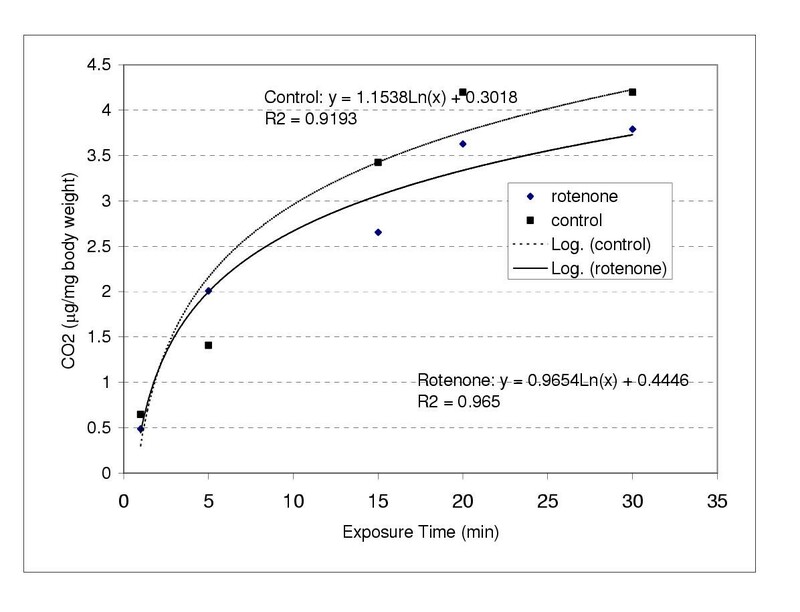 Effort to use extended exposure time was also tried, however, high morality was observed when P. americana was exposed to HCN and rotenone at higher dose, or for longer time (>60 min and >35 min, respectively). There was no particular reason except availability for using P. Americana instead of B. germanica. 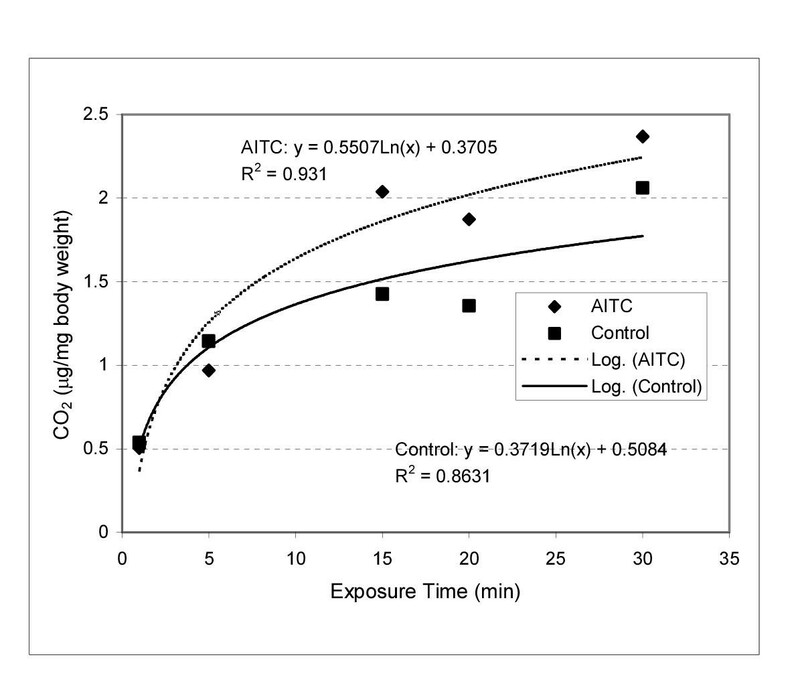 The effect of AITC on CO2 emission of the P. americana at different time intervals. Each data point is an average of two replications. The effect of hydrogen cyanide on CO2 emission of the P. americana nymphs at different time intervals. Each data point is an average of two replications. The effect of rotenone on CO2 emission of the P. americana at different time intervals. Each data point is an average of two replications. Toxicity of isothiocyanates has been attributed to inactivation of the thiol group of essential enzymes . The mode of action of many isothiocyanate compounds has also been attributed to their capability for alkylating the nucleophilic groups of biopolymers such as DNA, thus having cytotoxic properties which can affect the formation of the spiracular epidermis and crochet on the prolegs of tobacco hornworm (Manduca sexta L.) caterpillars [28–30]. Our bioassay avoids totally any direct contact between the insects and the chemical, thus the insecticidal effect is very likely caused by inspiration of the chemical by the insects through their spiracles. The increased CO2 emission observed in this study indicated a different mode of action of these glucosinolate breakdown products. This new mode of action may be similar to that of the dinitrophenols, although further investigation is needed to prove this speculation. Compounds such as dinitrophenol are uncouplers or inhibitors of oxidative phosphorylation . When the coupling between the respiratory chain and phosphorylation is broken, respiratory control is lost, and the electron transport along the chain occurs at full speed without producing ATP, the high energy molecule. Uncouplers kill insects not by inhibiting normal electron transport of the respiratory chain, but rather by enhancing the respiration [27, 31]. When the energy-transfer (production of ATP) is blocked, and at the same time, the respiration is accelerated, the insects have to use their stored energy sources and the exhaustion of those resources then lead directly to the death of the insects . Insecticides such as rotenone and HCN are known to affect the respiratory function by inhibiting certain enzymes in the respiratory electron transport chain of insects, thus reducing the oxygen consumption and perhaps CO2 production as well . This may explain why HCN did not increase the CO2 emission at low dose. Using glucosinolate breakdown products as safer fumigants in pest control is a novel approach in integrated pest management, and at the same time, since these natural products are considered fully biodegradable and less toxic, considering many cruciferous vegetables are consumed daily, there should be fewer environmental concerns. The bioactivity of these compounds may be from their effect on the insect respiratory system indicated by the inhibited or accelerated CO2 production. Dichlorovos and chloropicrin were purchased from ChemService (West Chester, PA). Allyl isothiocyanate, allyl isocyanate, allyl cyanide and rotenone were purchased from Aldrich Chemical Co. (Milwaukee, WI). Allyl thiocyanate was synthesized in this laboratory by reacting allyl chloride with potassium thiocyanate (KSCN) in dimethyl sulfoxide (DMSO). Briefly, KSCN (0.31 mol) and DMSO (200 ml) were added to a 1-L flask and heated on a water bath to 85°C followed by addition of allyl chloride (0.30 mol) to the flask. The mixture was allowed to cool to room temperature, and then the product ATC was extracted with ethyl ether (200 ml × 4). ATC was purified using column chromatography on silica gel with 2/10 ether/hexane, and the structure was confirmed by nuclear magnetic resonance (NMR) and infrared (IR) spectroscopy: 1H NMR δTMS (CDCl3) ppm: 3.58 (2H, d, -CH2-SCN), 5.34–5.43 (2H, dd, CH2-CH-), 5.86–6.02 (1H, m, CH2-CH-); IR: 2930–2960, 2870, 2160, 1640,1400, 1230, 985, 930 cm-1. l-Cyano-2-hydroxy-3-butene (CHB) was extracted from the defatted crambe meal. One hundred g of the crambe meal (National Sun Inc., Enderland, ND) was extracted with CH2Cl2 at 45°C in a Soxhlet apparatus overnight, and isolated and purified by using column and thin layer chromatography. The structure of CHB was confirmed by NMR and mass spectrometry: 1H NMR δTMS (CDCl3) ppm: 2.60 (2H, dd, -CH2-CN), 2.75 (H, brs, -CH(OH)-), 4.37–4.50 (1H, m, -CH(OH)-), 5.25–5.45 (2H, m, CH2-CH-), 5.85–5.98 (1H, m, CH2-CH-); IR: 3480, 3000, 2930, 2270, 1640, 14251135, 1070, 1000, 945 cm-1. The above NMR was consistent with that of Das and Torssell  and the IR data is in accordance with Daxenbichler et al.. Approximately 1 g 1/1 dry sucrose/powdered milk was placed in the bottom of a 40-ml jar, along with a 2-cm piece of cotton roll moistened with distilled water. Ten to 15 house fly adults (Musca domestica L., laboratory reared Orlando regular strain, one week post-emergence) were anesthetized with carbon dioxide and placed in the 40-ml jars. The jars were each covered with nylon mesh secured by a rubber band. Three 40 ml jars were placed in the bottom of a 2745 ml amber jar. A filter paper (Whatman No. 1, 9-cm diameter) was folded in quarters and placed in the jar as well. About 30 min after the flies recovered from anesthesia, 200 μl of the appropriate corn oil (Flavorite™ pure corn oil, Preferred Products, Inc., Chaska, MN) solution of the chemicals was applied to the filter paper with an eppendorf pipette, the disposable tip of which was left in the jar. The control was treated under the same conditions with a corn oil blank. The above jar was tightly sealed and left for 24 h, when mortality was read. The insects were considered dead when they displayed no observable motion when prodded. LC50 was calculated based on 5 concentrations. Ten adult lesser grain borers (Rhyzopertha dominica Fabricius, laboratory reared Manhattan KS strain) were placed in a 1.5 × 5-cm glass tube with 2 g whole wheat kernels. The tubes were closed on both ends by a tight metal mesh secured with parafilm. Three tubes were tied together with a wire, and suspended from the top of a jar (490 ml). A filter paper (same as used in the fly test), was folded in quarters and placed at the bottom of the jar. One hundred μl of the appropriate corn oil dilution of the chemicals was applied to the filter paper with an eppendorf pipette, the disposable tip of which was left in the jar. Corn oil was used in the control. The jar was tightly capped and left for 24 h, at which time the mortality was recorded. An insect was considered dead when it displayed no observable motion upon prodding. LC50 was calculated based on 5 concentrations. We chose the German (Blattella germanica L.) and the American cockroach (Periplaneta americana L.) in this test because they are non-flying, thus producing a steady and measurable quantity of CO2. Two adult B. germanica (1 male, 1 female without ootheca) or 2 nymphs (average weight 0.55 g) of P. americana were weighed and put in a glass tube (5 × 1.5 cm) with both ends covered with mesh screen. A bigger size of tubing (5 × 2 cm) was used for the P. americana. The tube was then placed into a glass bottle (220 ml) together with a quarterly folded filter paper (same as used above). A rubber stopper with glass inlet and outlet was tightly capped on the bottle with both ends sealed with a rubber septum (Fig 1). An infrared carbon dioxide analyzer (LIRA® Infrared gas analyzer, Model 3000, Mine Safety Appliances Company, Pittsburgh, PA) was used to measure the emitted CO2. The sealed bottle was flushed with CO2-free air (compressed air filtered through soda lime tubes and a NaOH trap) before introducing the chemical. 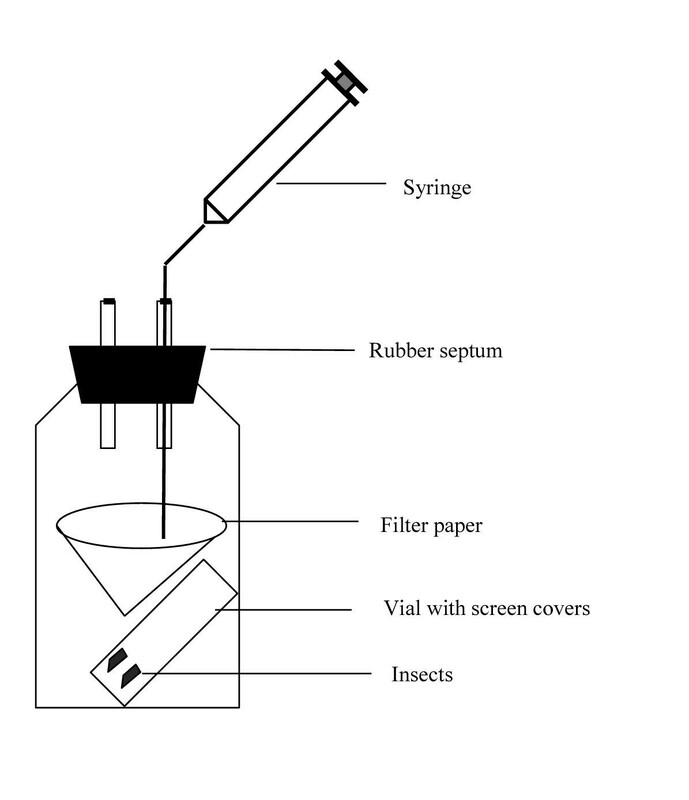 A sub-lethal dose of the breakdown products (200 μl of 10000 ppm chemical in corn oil for the B. germanica, and 100 μl of 1000 ppm for P. americana) was immediately injected with a syringe through the septum onto the filter paper inside the system (Fig. 1). In this system, direct contact between the insects and the chemical is completely avoided. The CO2 emitted by the test insects was recorded at Range 1 (the most sensitive range) of the instrument at different exposure times. There were three replicates for each treatment unless stated otherwise, and the same volume of corn oil was used in the control. Tests on the effect of HCN were achieved by wetting the filter paper with 100 μl of 1 N HCl, and, after flushing out the CO2, injecting 20 μl of 1 N NaCN aqueous solution onto the paper. Rotenone (5 μl of 100 ppm in acetone) was injected to the thorax of the P. americana nymph in the CO2 test and same the amount of acetone was used in the control. Water or acetone was used in the control for HCN or rotenone. A descriptive diagram of the apparatus used in the insect CO2 monitoring test. Probit analysis was used to determine LC50, 95% FL, and slopes according to methods outlined by Finney . Means were separated using least significant differences (LSD) (P = 0.05) . The authors thank Dr. T. A. Anderson of the Texas Tech University, Texas, USA for his assistance in the use of the infrared carbon dioxide analyzer.